Pure chocolate indulgence made in just 5 quick minutes. 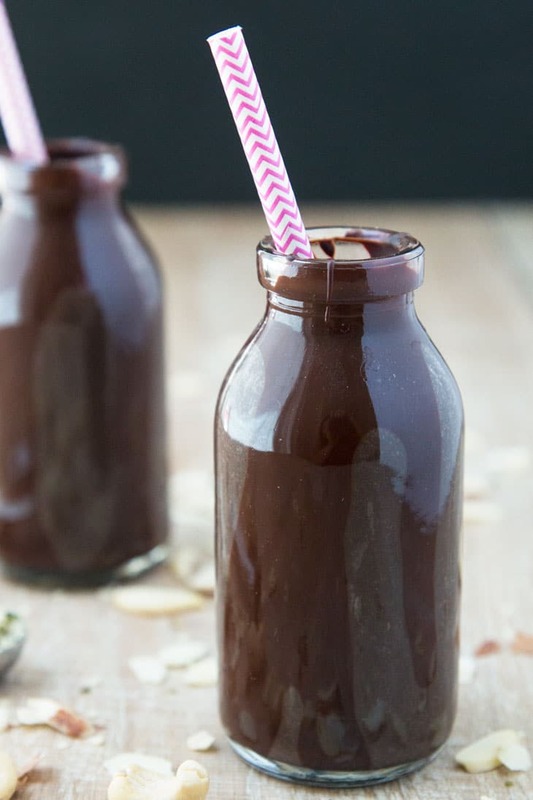 This Chocolate Milk Recipe is rich, creamy, protein-packed, healthy, refined-sugar free, vegan, and so so delicious that you’ll have your kids asking for a second glass! Ok…maybe not everyday, but at least 3 times a week. Because why not?? It’s so darn good for you!! In efforts to come up with a homemade easy vegan chocolate milk recipe for my kids, I created this rich and creamy chocolate indulgence! Because that’s really what it is…pure indulgence. Never mind that it’s packed with good-for-you ingredients and contains loads of protein. It’s become quite the popular drink in our household for the past few months and for me, it’s the perfect after school snack when the kids have a busy afternoon filled with sports. 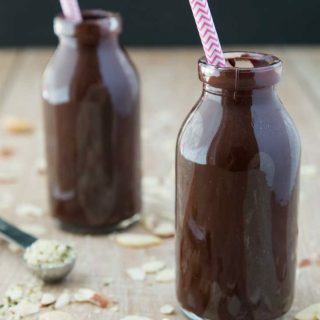 I knew I had to come up with an easy vegan chocolate milk recipe after hearing what my husbands gives to the kids when they ask for chocolate milk: non-dairy milk, cocoa powder, some form of sugar (coconut sugar or maple syrup), all mixed together with a spoon. If any of you have tried mixing in cocoa powder and sugar into cold milk with a spoon, you’d know that it doesn’t mix in well, leaves clumps of cocoa powder, and leaves the sugar at the bottom 🙂 Of course props to him for the effort, especially since all store-bought chocolate milk add-ins typically contain some form of milk protein and loads of refined sugar. This recipe first took form when I had leftover cashew cream and date paste (water blended with dates) in the fridge that I needed to use up. I added it into my kids afternoon milk for some healthy fats, along with cocoa powder, and gave it a whirl in the blender. Out came a pretty decent chocolate milk that the kids seemed to enjoy! So I thought why not add in a few raw nuts next time (especially since my son doesn’t like eating raw nuts and I don’t typically have cashew cream on hand) along with some other healthy fats. 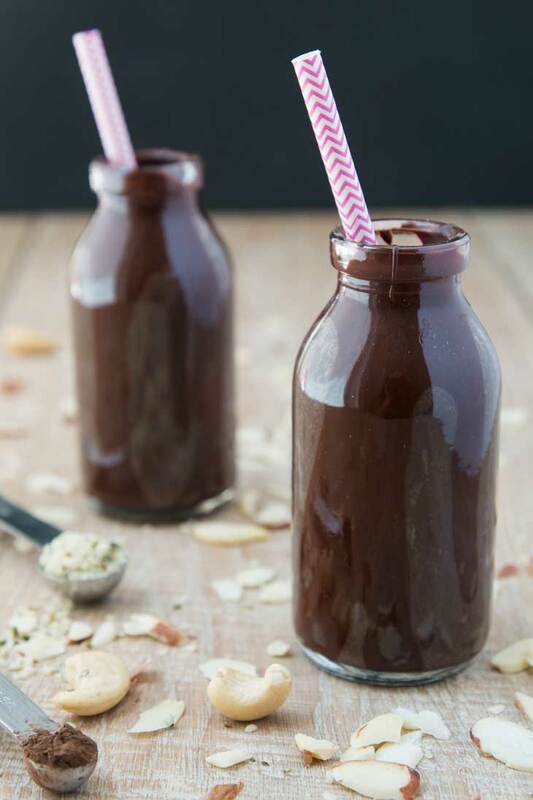 The ingredients are simple…cocoa powder, non-dairy unsweetened milk, almonds, cashews, dates, hemp seeds, and coconut oil. The coconut oil was a last addition since I love the flavor of coconut and chocolate together. My kids thought it was odd when they saw me adding oil to their chocolate milk (haha!) but when they tried it, they loved it! The nuts make it thick, creamy, and rich (especially the cashews). The hemp seeds and coconut oil add extra healthy fats. Since dates have officially been picked by the 100’s from my in-laws backyard over the past month, they are the natural sweetener of choice, and of course cocoa powder for the chocolate. This is definitely a blender recipe since you’re adding in whole nuts. If you don’t have a powerful blender, simply use soaked nuts instead. If you’re allergic to nuts, leave them out and you’ll still get a delicious chocolate milk, just not as rich and creamy as the nut version. And who said chocolate milk is only for kids?? I know I indulge in this every now and then 🙂 So enjoy a glass yourself, or throw in a shot of espresso and pour it over ice! Either way, please try this recipe out…I guarantee you’ll love it! And if you’re not a chocolate fan, then try my Strawberry Hemp Milkshake instead! Pure chocolate indulgence made in just 5 quick minutes. 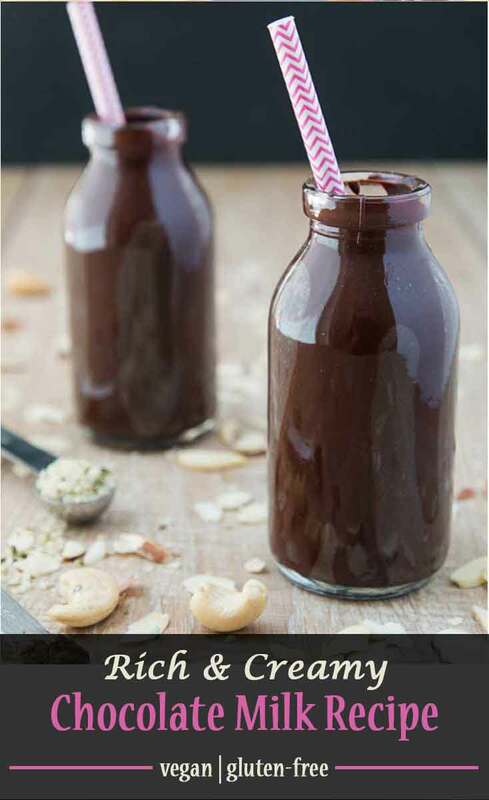 This Chocolate Milk Recipe is rich, creamy, protein-packed, healthy, refined-sugar free, vegan, and so delicious! Add all the ingredients into a powerful blender (such as a vitamix). If you don't have a powerful blender, be sure to soak the almonds and cashews for 3-4 hours and drain prior to using. Add in 2-3 ice cubes if you want colder chocolate milk. Blend until all the ingredients are completely pureed and smooth. Pour into your favorite glasses, add straws, and serve! Depending on the size of your Medjool dates, add more (5) or less (4) dates. Adjust according to preference for additional sweetness. I prefer to use SILK unsweetened almond milk for this recipe. For a nut-free version, use coconut milk and omit the cashews and almonds. It will not be as rich and creamy, but should still taste great! Ohhhh wonderful, I have never thought of nut milks as a sneaky nutrient delivery system for children. Great idea! Give them what they ask for plus a little something extra. Love it! That is the most decadent chocolate milk I've ever seen! Of course your kiddos would ask for you to make it every day. :) LOVE the suggestion of putting a shot of espresso in it. YUM! I'm all about espresso in everything ha! The milk is so rich and creamy...the kids crave it! This looks oh-so-rich and creamy! I love the used of dates in there, too. They're so fab for sweetening things up just right, and without all that crappy unnatural sugar. So much better and thick and creamy! Plus, my in-laws grow it by the dozens in their yard! I think my kids would love this too! I love how you've used dates as a sweetener. Sounds so delicious! Thank you! Totally a kid favorite. I'm totally sold on this! I follow a dairy free diet so this is the chocolate milk for me! No surprise the kids loved it! This looks SO rich and delicious and I love that it's good for you, too! I need to try this ASAP. I bet this would be especially delish used as the wet ingredient in overnight oats, it has all the right elements -- dates, nuts, milk, cocoa! Yum, it's like a breakfast dessert! Oh great idea!! I already have a chocolate overnight oats recipe, but this would definitely be amazing and much more rich! Thanks Reshana! you'll love it! We love making our own chocolate milk! And with a Vitamix it comes out nice and hot so no need to warm it. Looks delish! Thanks Sophia! although with this weather we've been having, I'm adding ice to their chocolate milk to keep it cool haha! I don't know how I am with raw cashews, but I do know how I get with raw almonds...and it's not good. Would using roasted almonds (and/or cashews) change the flavor/texture/nutrients much? I think using roasted almonds and cashews would be totally fine, just keep the amount of salt in mind since most roasted nuts are also salted. Otherwise it'd still taste great! Cookies are coming right up! My kids will also ask this kind of chocolate drink every day. I will make this soon:) so creamy and rich. Looks delicious Anjali. Thanks Uma! let me know once you try it! I love home made plant based milks :)! This. Was. Awesome. I used to make vanilla almond milk with dates, almonds and vanilla extract (which I loved but my daughter didn't, so I stopped making it). Your version with the included cashews and chocolate was a hit! Thanks!! that's awesome!!! So glad you guys loved it...it's the only way to get nuts into S haha, and it's nice and hearty. I have a vanilla version coming sometime in the next few months, very similar to this recipe with a few mods :) Thanks for trying it! Hi, this is a great recipe. How long will this last in the fridge? Thank you!! It should last in the fridge for 2-3 days...? Could you tell me if this recipe is possible without the coconut oil as I am not allowed any fats or oils? Absolutely! The coconut oil is completely optional! I mainly add it for extra fats in my kids and that coconut flavor, but this recipe tastes great without it! Let me know if you try.